[miau] Tennis is one of the world’s oldest, most popular games. However, it doesn’t always do that well in popular culture outside of the tennis court. For instance, there aren’t a lot of movies about tennis, and outside of the Wii, you won’t find many tennis video games. 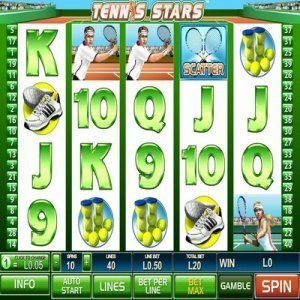 So, the fact that the Tennis Stars online video slot machine is so popular is quite surprising and refreshing. What is it, exactly, about Tennis Stars slots that’s so trendy? Let’s have a look at the different features of this game to find out what’s going on inside. Tennis Stars slots isn’t anything out of the ordinary at first glance. It is a 5-reel, 20-payline machine. Nothing spectacular or fancy. However, it was developed and released by Playtech, one of the leaders of online gambling games. Playtech has a long and solid reputation of delivering fun, action-packed, big-paying games, and Tennis Stars is no exception. With wilds, scatters and multipliers, Tennis Stars instantly offers up a lot of different ways to win. And the graphics are really great. The wild symbol also serves a dual purpose. Not only does it replace all other symbols, but it also gives 15 free spins. If you’re lucky enough to hit the Championship Bonus Game, you will see what all the fuss is about with a Playtech online slot machine. The stunning graphics come to life in this round, where you actually get to play tennis in either the men’s or women’s singles category. You can select which type of serve you want, and send the ball flying down. Of course, it’s set up to always let you win the match, but the fun part comes by way of finding out what your prize is. Each time you serve an ace, your prize will start growing. In terms of the betting options for Tennis Stars, there is a lot here to satisfy any player on any budget. The overall betting range goes from 0.25 all the way up to 1,000, which means it is definitely a friendly slot machine for high rollers. And while the game is not in Playtech’s progressive lineup, it does have a maximum jackpot payout of $500,000, which is a huge payday for anyone lucky enough to hit it. Other than that, the betting features are fairly tame. Use the bottom of the screen to bet on different paylines, to adjust your betting amount, or to enable the autoplay feature. Even if tennis isn’t your favorite game, you’re bound to appreciate Tennis Stars. Great graphics, a cool bonus round, and a gigantic jackpot that pays off half a million dollars. For a non-progressive machine, it is definitely one of the most lucrative around.